إذا كنت تبحث عن عقار بموقع جيد في المدينة، فقد وجدت ضالتك في Alpha Sovereign Hotel. يقع مركز المدينة على بعد 1 km فقط. ويمكن الوصول إلى المطار خلال 35 دقيقة. يقع هذا الفندق الحديث على مسافة قريبة من المعالم السياحية الشهيرة. ببساطة كل الخدمات وأساليب الضيافة التي تشتهر بها Alpha Hotels and Resorts تجعلك تشعر وكأنك في بيتك. تتضمن الميزات الرئيسية في هذا الفندق: واي فاي مجاني في جميع الغرف, أمن على مدار 24 ساعة, متجر, خدمة التنظيف يوميًا, متجر هدايا/تذكارات. استمتع بوسائل الراحة الراقية في الغرف أثناء إقامتك هنا. بعض الغرف تتضمن تلفزيون بشاشة مسطحة, بياضات, مرآة, صوفا, مناشف لمساعدتك على استعادة طاقتك بعد يوم طويل. يقدم الفندق مجموعة رائعة من الخدمات كمثل مركز للياقة البدنية, ساونا, حمام سباحة خارجي, سبا, مسبح (للأطفال)، لجعل إقامتك تجربة لا تنسى. يشكل Alpha Sovereign Hotel بخدماته الراقية وموقعه الممتاز، قاعدة مثالية للاستمتاع بإقامتك في المدينة. توجد رسوم إضافية على بطاقات الائتمان ماستر كارد وفيزا بنسبة 1.5% ورسوم إضافية 3.5% على Amex و Diners. Just a couple of things to take note before you book: Parking is not free and they charge $15 per day. You can park on the street though. They advertise free internet but you might not be able to get any internet in the room. The staff themselves told me that its the strongest around the reception area and becomes weak in the rooms. We couldn't use it in our room. Apart from the above everything else was nice. Location is really good. 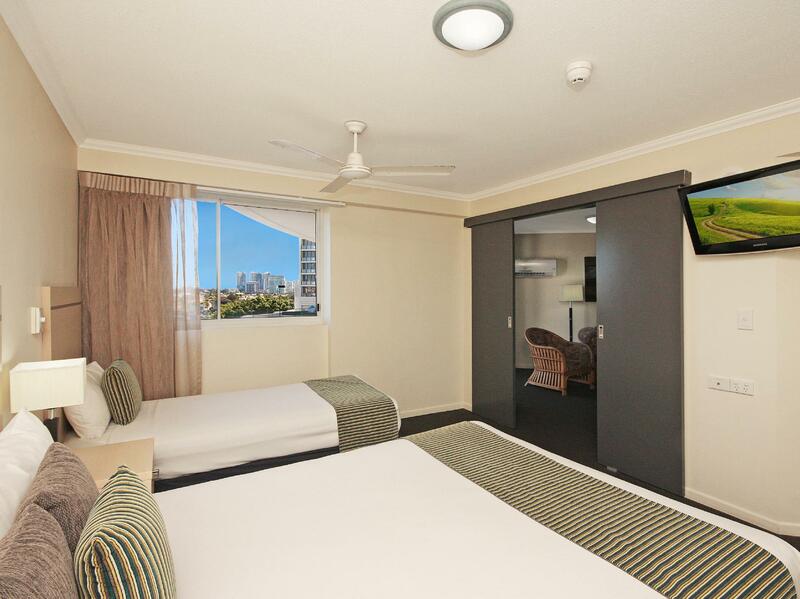 Just 2-3 minute walk to the tram station and 2-3 stops to the beach and shops. The room we were given was very badly needing updated . The shower room was the worst I have ever seen .Charging $15 per night for valet parking was ridiculous but on the plus side the bed and towels were clean . We were very pleased with all aspects of the Australis and could find no fault. The valet parking was peace of mind, the room was very big and our balcony view was lovely. The hotel is on the wrong side of the Gold Coast Highway and not overlooking the beach, I timed the walk to the beach, including crossing the Highway at nearby lights, it took 5 minutes. A 15 minute beach walk to Carvil Avenue and all its noisy attractions, but realistically you would prefer the comfortable buffer. Breakfast included, it was a very affordable quality hotel, we will return. 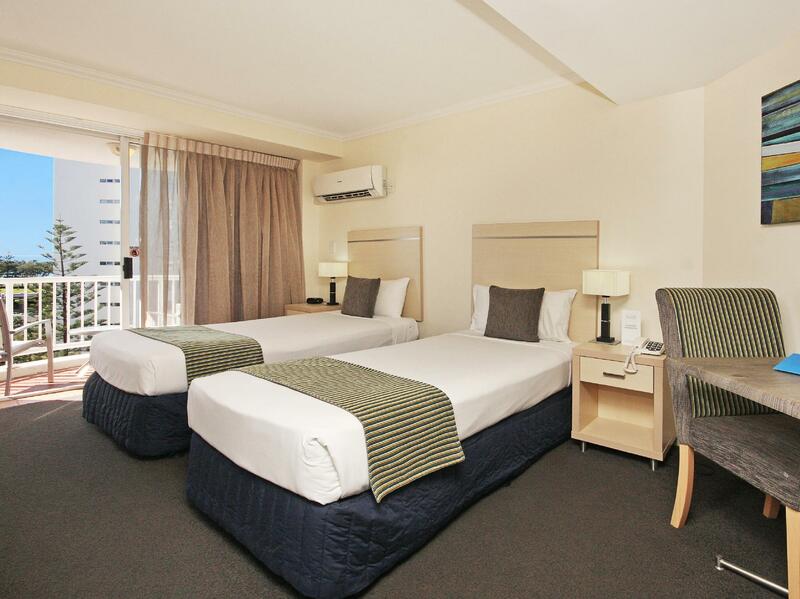 Friendly staff, spacious room, easily accessible. Booked a one bedroom suite for two nights but was given a two bedroom suite. The room was clean and spacious. Hotel was easily accessible with the tram and bus stops. Only a 15 mins walk to surfer's paradise beach. Value for money! I’ve been married for 30 years and never have I slept in a single bed next to my husband. We were very disappointed to find our room with 2 single beds. When I asked for a large bed. ... I asked to change and they couldn’t. Our room wasn’t cleaned every day. We had to use the same dirty linen . When I asked at the desk to make sure my room was cleaned. All I got was fresh linen and my beds made in the same sheets I had on for 2 days . The wifi constantly dropped out. No Foxtel The cleaning service was not the best we had to ask for clean towels and toilet paper Didn't like emptying the bin Air conditioning stopped working a couple of times. Dusty room with unreasonable price. You do need to leave the car key to the reception for them to take your car in or out with only 1 guy doing it. wasting lots of time to wait just only when if you forget something in the car. We reach early and the DM let us check in early after the room was ready. The staff do not provide any details on the hotel and not even told me that the simple check in policy. Very disappointed with the service and the staff told me that all of the hotel checkout at 10am and I should know during the booking. I was wondering your job as a receptionist should told the guest basic details about the hotel. Not only that, the staff not even told me what I have during the stay. In this hotel mention 4 star and I can't even see the professional of the service that provided by the staff. There weren’t many faults with this hotel, the location was a little further out from the central area and it was a little outdated but apart from that everything was exactly as expected and it was pleasantly quiet also! Big thumbs up! Although other reviews had scared me a little and I’d prepared for the worst, we as a family were pleasantly surprised. Rooms huge, daily room service and pool always had space for us to relax or swim. We loved the pool drink service during happy hour too! Our room wasn’t loud like I’d seen other people review and we had a beautiful view of the beach!!! I suppose it’s all relative....if you’re not paying top dollar, don’t expect 5 stars right?? Bus stop was located about 50m from the hotel, tram stop was about 150m. So easy to get around. 15-20m walk to Cavill Ave which had everything and 10min walk to the beach. Staff made your bed everyday and put on the dishwasher which was such a lovely touch. Pool, spa and sauna were great and there seemed to be ‘room for everyone’. 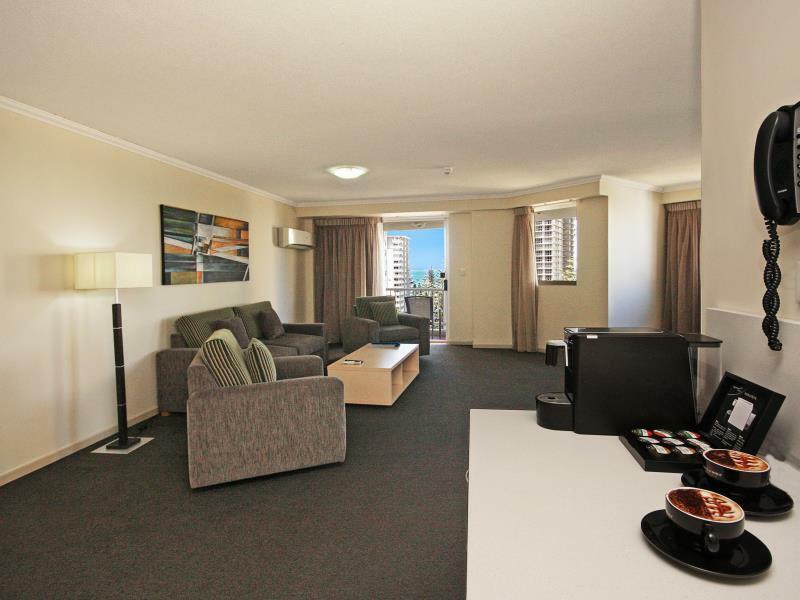 I think it’s location so the stand out because you are right in the heart of Surfers Paradise but not in the busy bit, so it’s the best of both worlds. The buses for Theme Parks, Harbour Town and Pacific Fair stop almost right outside. I would happily stay there again! The pool was not fixed, but we were able to use the pools across the road in another resort. It was fine for the price I was not very happy with the issue at the start, which was I was meat to be able to pay at the hotel on check in, but apparently that was not the case & was required to pay up front, with a no cancellation fee, I was in a lose lose situation. I felt as thou I was given the incorrect information when booking, no one wanted to take responsibility for this Check all your bookings carefully! Obviously seen better days and in need of a refurb soon but I have stayed at plenty worse. 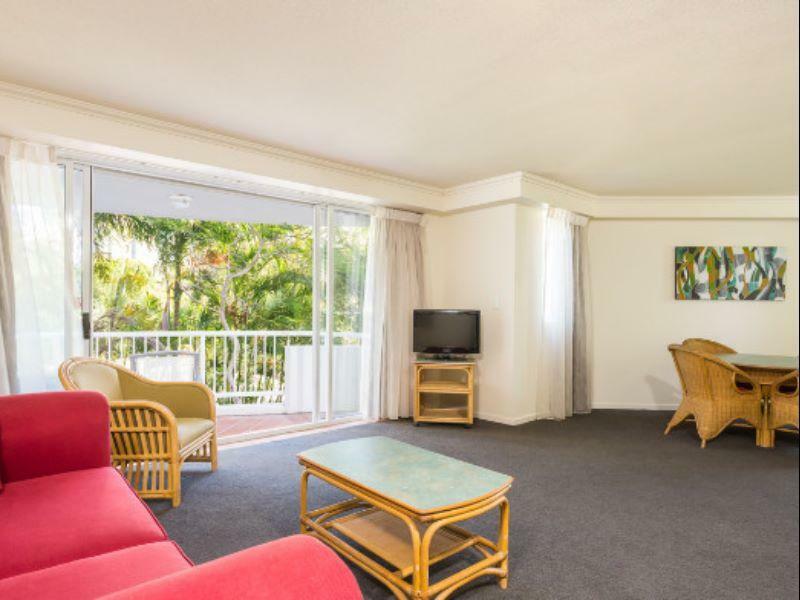 Good location, two blocks from beach and two stops on the nearby tram to the centre of Surfers or a few stops further to Broadbeach. Friendly and helpful staff. Very comfortable bed and all the basic facilities (but only the basic ones). Great value for money. considering i am in a wheelchair i highly recommend this accom as it caters to wheelchair users appropriately. staff were above excellant with customer service. Truely of International standards. Would recommend highly to disabled or ageing guests and their family. Staf would be the best I have had any dealings with on the Gold Coast. 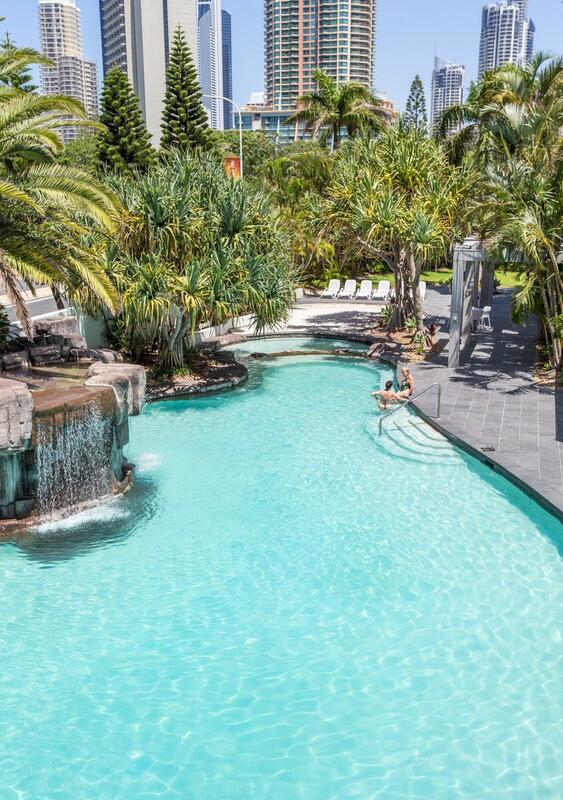 My friends and I booked a last minute trip to the Gold Coast for 2 nights over Australia day. The staff at this hotel are amazing, the bar lady in particular on Thursday was super helpful and great customer service. The pool area is gorgeous and we had the best day lazing by the pool, the only negative is the family suite could do with a splash of paint, but other than that Amazing staff, amazing stay. We were upgraded on arrival so that was a bonus. 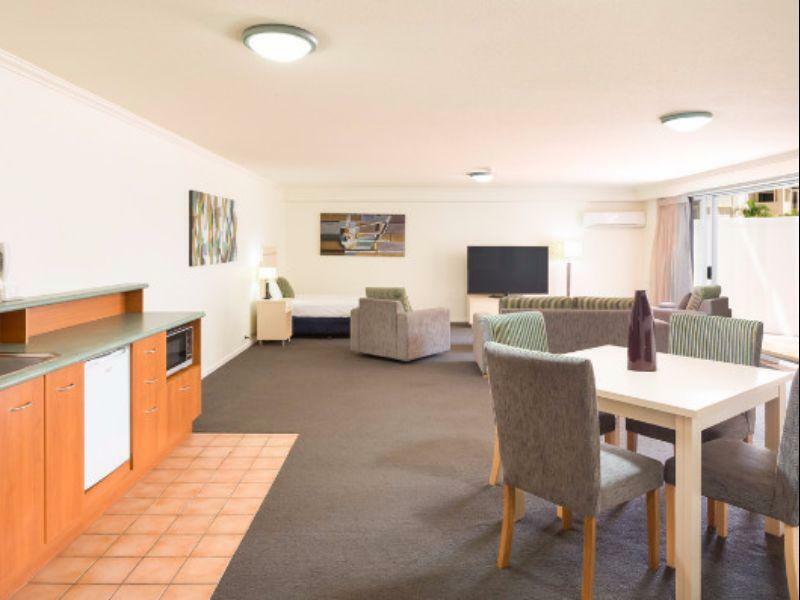 Spacious longe/kitchenette area with separate bedroom. Nice balcony. Very good value. Short walk into central Surfers. Housekeeping made beds and provided towels but did no other cleaning during our stay.